SEAS has an extensive background in integration of survey data into a GIS format from LiDAR, GPS, Hydrographic, Photogrammetric, and Total Station data. SEAS is at the forefront of GIS data collection through innovative integration and development of survey technology, software and data collection procedures. These data sets are Delivered in Geodatabases and shapefiles which are SDSFIE and/or IENC Encoding Guide compliant. SEAS is an industry leader in GIS surveys of Inland Waterways and has provided the USACE Inland Electronic Navigational Charts (IENC) GIS base mapping product, for over 3500 miles of navigable waterway. SEAS has also performed GIS data collection for projects at Military Installations including Eglin AFB, FL, AUTEC Navy Base, Andros Island Bahamas, Hurlburt Field AFB, FL, and Fort Knox (DAGIR Range), KY.
SEAS Team has extensive CADD experience with public, private, and federal projects. Our technicians are seasoned in using multiple software suites to accomplish the best product possible for the client and meet the required standards such as AEC/CADD, individual local government standards, specific private company’s standards, or USACE District’s specific CADD standards. 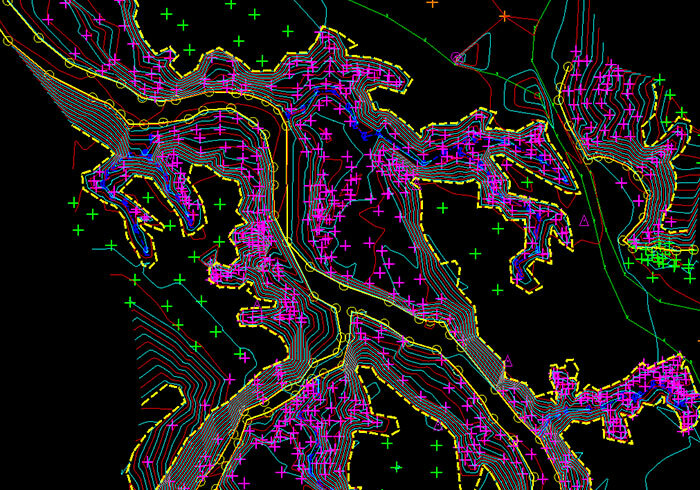 AutoCAD Civil 3D and Bentley products such as MicroStation Connect, PowerSurvey, and Inroads Suite are used to generate Digital Terrain Models (DTMs) and create 3D model files (DGNs) of plan views of hydrographic and topographic surveys with contour data. These products are delivered as Sheet Files and Model Files with specific naming conventions as required. SEAS CADD technicians also use AutoCAD Civil 3D to produce drawing files and Triangular Irregular Network (TIN) files. LiDAR/Laser Scan data (Point Clouds) in las/laz and pod file formats and Imagery is processed and edited in MicroStation with Terrasolid products (TerraScan, TerraMatch and TerraPhoto) and Certainty 3Ds product TopoDot as well as AutoCad Civil 3D. SEAS has also produced and submitted ISO 19115 or FGDC compliant Metadata files for hundreds of projects. SEAS can integrate and conform to meet the specific needs of each client. SEAS personnel have completed projects on the following rivers, lakes, bays, etc.